Today's column examines the increasingly obvious automotive truth that your car isn't "special" just because it's a "special edition." A friend of mine recently told me that he has been given the opportunity to trade his Fox body Mustang for – are you ready for it? – a 1998 Lincoln Mark VIII Collector's Edition. "Collector's Edition," he repeated, as he told me this, implying that no collection would really be complete without this vehicle parked right next to, say, a pristine Series I Jaguar E-Type. A little searching on the Internet helped us understand precisely what the Collector's Edition was. Apparently, Lincoln created it by taking a standard Mark VIII, sticking on new wheel caps and "Collector's Edition" badging, and adding "genuine walnut" trim. There was also a "collector's gift" which included – this is the truth – little silver plates depicting previous "Mark" models. Finally, Lincoln included a certificate of authenticity, should anyone ever doubt the veracity of your Collector's Edition. In other words: this was a cynical run-out model designed to appeal to people who didn't know any better. For those of you who don't quite follow me, let's take a look at a few other special editions. I think we can all agree that the reigning champion is Lamborghini, who – at last count – offered 972 different special editions of its Gallardo supercar. My friend Andrew knows all of them. We'll be sitting at a meal and a Gallardo will go by; a Gallardo that – to me – looks absolutely identical to every other Gallardo, except maybe it has a rather grotesque rear wing, and Andrew will say: "That's the Gallardo LP575 Dash 8 Point 6 Costa Concordia. It has different floor mats than the last Gallardo special edition. You know: the LP583 Dash 7 Point 4 Amanda Knox Retrial." That's because the Gallardo special edition situation spiraled completely out of control. What happened was, Lamborghini debuted the Gallardo in approximately 2004, which is back when Ferrari was still making the 360. Then Ferrari came out with the 430, which made the Gallardo feel just a little bit old, so they came out with the Gallardo Spyder. 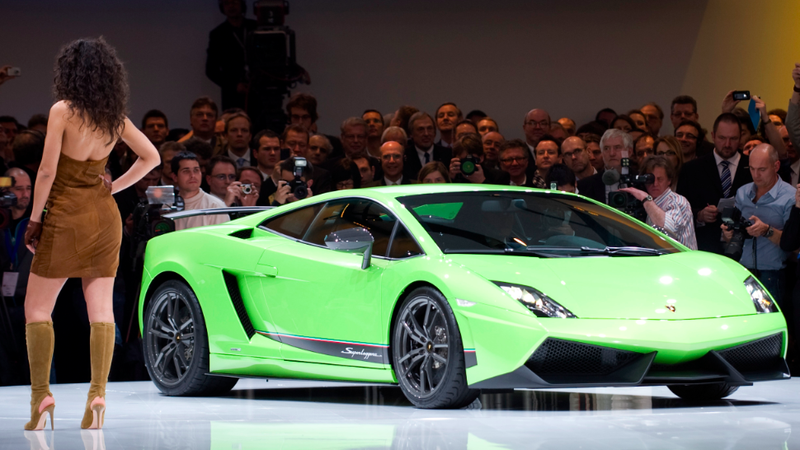 And then the Gallardo Superleggera. And then the Gallardo Nera. And then the Gallardo SE. And then Ferrari came out with another entirely new car, the 458, which just sent Lamborghini into a complete tizzy, because they couldn't afford to redesign the Gallardo yet. So they came out with even more special editions to try and convince Lamborghini owners – who, let's be honest, aren't the most discerning bunch – that the Gallardo was still new and hip. This primarily involved adding big wings on the back. Of course, Lamborghini isn't the only culprit here. Many automakers use "special editions" to try and convince people that an aging model isn't the same old crap they should've redesigned last year, except that some bright young product planner insisted that new wheels and a special paint color would be worth at least 10,000 extra sales. Supplier: We accidentally made 86 square alloy wheels! Chrysler: That's OK! We will create a highly sought-after 21-unit run of the Grand Cherokee Square Wheels Edition! Supplier: But that's only 84 wheels! Chrysler: That's OK! We will create a highly sought after 1-unit run of the Grand Cherokee Half Square Wheels And Half Round Wheels Edition! And so it went. My favorite example of this came in 2006, when Jeep offered a "65th Anniversary Edition" of every model in its lineup, which, when you really think about it, was sort of a celebration of America getting involved in World War II. Anyway: I had a friend who was searching for cars back then, and she was trying to decide between the Toyota RAV4, which was excellent, the Honda CR-V, which was excellent, or the Jeep Liberty, which was in its fifth year and starting to show its age. For example: while the RAV4 and CR-V offered a long list of desirable equipment and options, the Liberty primarily featured road noise. Of course, she chose the Liberty, primarily because the local Jeep dealer had her convinced that the 65th Anniversary Edition was tremendously special and it would, someday, appreciate in value. There will only be one 65th anniversary, they told her. Never mind the fact that the anniversary edition was limited to fender badging and unique seat covers. She had to have it. So much that she paid sticker. Now, at this point, you might be wondering: Doug, are you finally going to get on with your column and quit naming stupid special editions? And the answer is: no. There was the Porsche 911 Black Edition, the Ford Taurus 100th Anniversary Edition, the Lexus RX350 Pebble Beach Edition, the Lincoln Aviator Kitty Hawk Edition, the Toyota Tundra 1794 Edition, the Volvo XC90 Ocean Race Edition, and the Buick Regal Joseph Abboud Limited Edition. There were also several special edition Bugatti Veyrons, including the Sang Bleu, the Pur Sang, the L'Or Blanc, the Grand Sport, and the Go F*** Yourself, I'm Richer Than You. Now, I must admit that I'm not totally against special editions, because some of them are pretty cool. Here I am thinking of the Volkswagen Jetta Trek, which included a mountain bike, and the Lexus LS400 Coach Edition, which came with a set of luggage. Unfortunately, you'd never know this if you bought one used, because both of those items are still sitting in the original owner's garage. But I think that, going forward, there should be a ban on special editions unless there's really something to celebrate – because otherwise, they just aren't that special. No, Lincoln, "something to celebrate" does not include getting a deal on walnut steering wheels from your supplier. However: the 97th anniversary of Lincoln is coming up, and I think I speak for everyone when I say this sort of momentous event should warrant a 500-horsepower MKZ. With a manual transmission. And a certificate of authenticity.